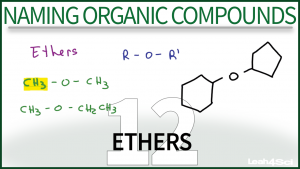 This tutorial videos takes you through both IUPAC and common rules for naming ethers. Examples covered include simple ethers, symmetrical ethers, substituted and diethers. This is Video 12 in the Naming Organic Compounds Video Series. Click HERE for the entire series. Thank you for sharing this. its a great help . I happy to hear that! My pleasure! Thank you so much – your videos are crystal clear!